MLA Jessica Littlewood of Fort Saskatchewan-Vegreville, meets with InnoTech Alberta representatives and partners at expanded hemp processing facility. The $800,000 investment in new equipment for the decortication line will help secure Alberta’s leadership in the growing hemp industry and improve the quality and efficiency of hemp and flax fibres produced at the facility. Improved fibres provide the foundation for a multitude of products, including green construction, automotive parts, erosion control, land reclamation, textiles, sustainable packaging and materials for the oil and gas industry. Established in 2010 with a $3.9-million Government of Alberta investment, the Vegreville fibre decortication processing plant is the only one of its kind in the world. Serving as a catalyst for industry growth, the pilot plant has been instrumental in advancing Alberta’s potential in the emerging hemp market. The facility is a critical bridge for industry, supporting research and product development. Hemp is a multi-functional crop with different end uses, including seeds for food and oil, fibres for composite material and bio-active chemicals for ingredients in the food and personal health-care industries. Decortication is the first step in processing which separates hemp into its valuable fractions –for textiles, composites, absorbents, building materials, animal bedding, mulch and more. Alberta is the second largest hemp production jurisdiction in North America with 44,684 acres in 2017. In 2016, the Canadian hemp industry was valued at $340 million and is anticipated to reach a market value of $1 billion by 2023. 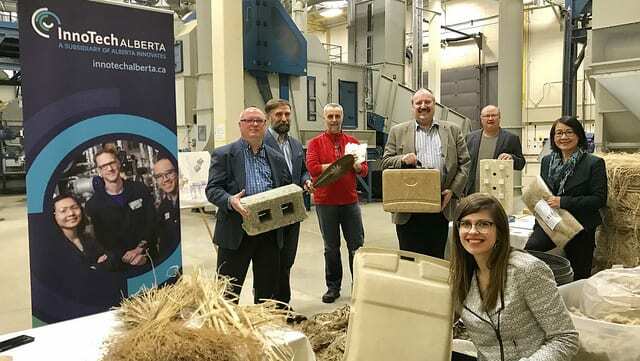 Commercialization of hemp fibre for various applications is gaining momentum in Alberta with 34 new hemp fibre-based products being successfully introduced to market in the past year.